JSONExtract reads data from JSON files using SAX technology. It can also read data from compressed files, input port, and dictionary. JSONExtract does not propagate metadata. JSONExtract has no metadata template. Metadata on optional input port must contain string or byte or cbyte field. Each metadata can use Autofilling Functions. File URL yes Attribute specifying what data source(s) will be read (JSON file, input port, dictionary). See Supported File URL Formats for Readers. Mapping of the input JSON structure to output ports. For more information, see XMLExtract Mapping Definition. Name of an external file, including its path which defines mapping of the input JSON structure to output ports. For more information, see XMLExtract Mapping Definition. URL of a file that should be used for creating the Mapping definition. For more information, see JSONExtract Mapping Editor and XSD Schema. By default, nested elements are also mapped to output ports automatically. If set to false, an explicit <Mapping> tag must be created for each such nested element. By default, white spaces from the beginning and the end of the elements values are removed. If set to false, they are not removed. Number of mappings to be skipped continuously throughout all source files. See Selecting Input Records. One of these must be specified. If both are specified, Mapping URL has higher priority. JSONExtract reads data from JSON files using SAX technology. This component is faster than JSONReader which can read JSON files too. JSONExtract does not use DOM, so it uses less memory than JSONReader. JSONExtract is very similar to XMLExtract. JSONExtract internally transforms JSON to XML and uses XMLExtract to parsing the data. Therefore, you can generate xsd file for corresponding xml file. Mapping in JSONExtract is almost same as in XMLExtract. The main difference is, that JSON does not have attributes. For more information, see XMLExtract's Details. JSONExtract Mapping Editor serves to set up mapping from JSON tree structure to one ore more output ports without the necessity of being aware how to create mapping of field using an XML editor. 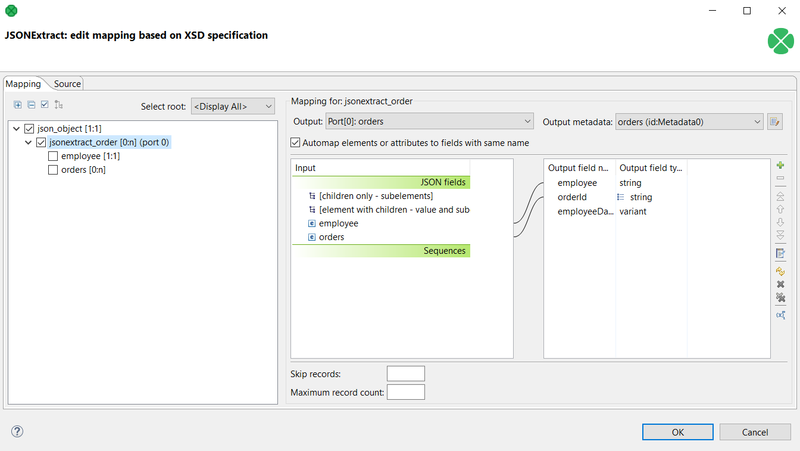 To be able to use the editor, the editor needs to have created equivalent xsd schema. The equivalent xsd schema is created automatically. Only the directory for the schema needs to be specified. Any other operations to set up mapping are described in above mentioned XMLExtract. In JSONExtract, you can map input fields to the output in the same way as you map JSON fields. The input field mapping works in all three processing modes. JSON file contains information about employees and orders. Each item contains employee ID and list of order IDs. Read data for further processing. Use the File URL attribute to point to the source file and the Mapping attribute to define mapping. 3.5.0-M2 JSONExtract is available since 3.5.0-M2. 4.1.0-M1 You can now map input fields to the output fields in this component. 4.1.0 You can now read lists.